We love games in our family, especially games that connect learning through fun! 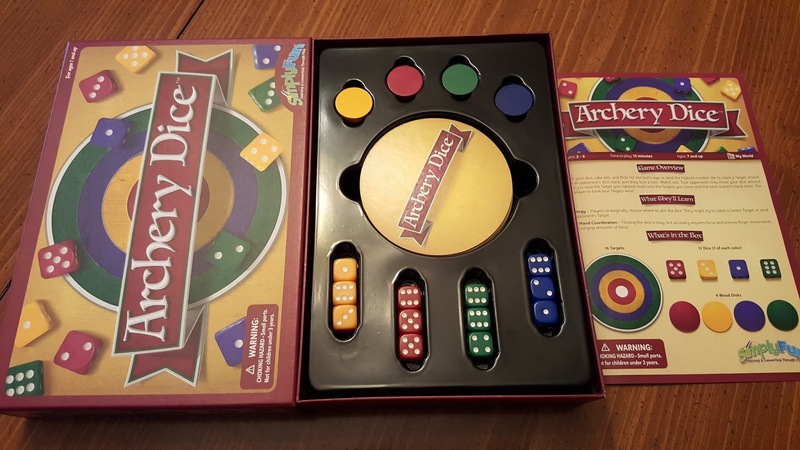 So, today I’m reviewing Archery Dice, one of four of new releases from SimplyFun. SimplyFun offers over 100 award winning options for families and teachers specifically to meet the needs and skills of children. If you are looking for a game that covers a special skill or interest, it is easy to search through what they have available. The crew will be reviewing 2 of the four new games and both of them have a medieval theme. I chose Archery Dice because it sounded right up our alley. I'll admit that my "mommy vision" automatically envisioned dice flying through the air, hitting walls, eye protection, etc. Does anyone else have these "mommy visions"?! Well, in case you do, let me go ahead and put your mind to ease. Part of the rules state that if your dice fly off the table or hit another players dice and knock them over, it is considered a foul dice and no longer in play. Phew! After opening our box, I was impressed right away with how sturdy it was and the organization compartments it contained. 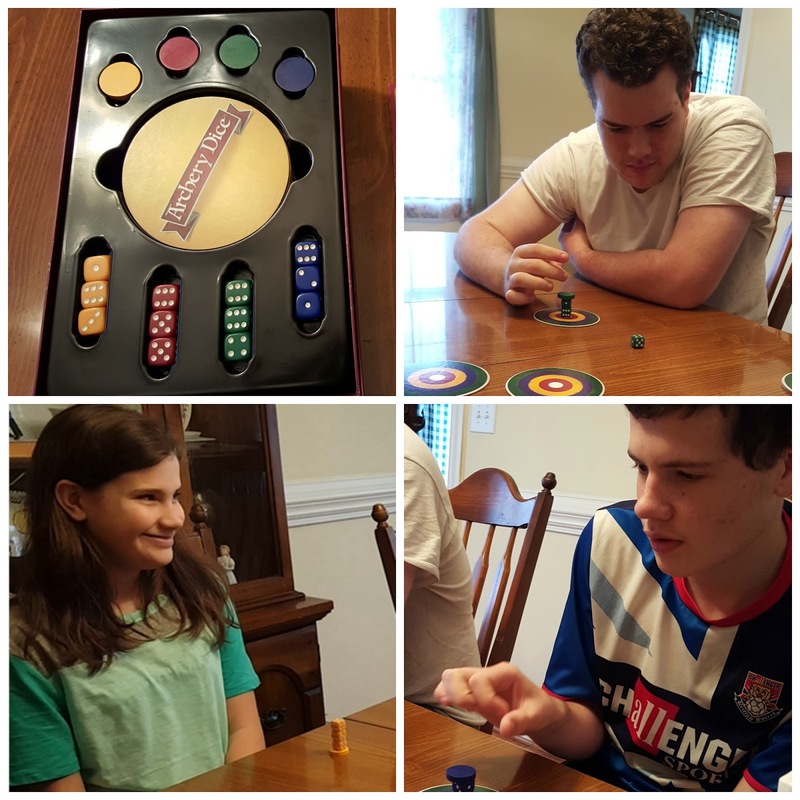 The game includes 16 targets, 12 dice (3 of each color), 4 wood disks, and a colorful instruction booklet. It is for 2-4 players, recommended for ages 7 and up, and sells for $26. It is not recommended for children under 3 since it contains small parts that could be a choking hazard. Skills focused on are eye-hand coordination and strategy skills. The instructions are very clear and give great color diagrams of how the set up area should look. Basic setup includes each player taking their 3 dice and stacking them up vertically on top of their wooden disk. 3 targets are placed in the center of the table creating a triangle. Each player then takes turns flicking their dice to try to land on the center targets with the ultimate goal of trying to hit a bull's-eye in the center or be the highest dice on the target. The player must immediately call bull's-eye if they do make it and they can then bank that target and no one can steal it. One round is over after each person has flicked their die. When flicking your die, you can aim for the center target or any opponent's targets won that have not been banked. After each round ends, if any player has landed on a target, the one with the highest number die or dice gets to put that target under their stack of dice and disk. At that point, other players can try to steal those targets. As I mentioned earlier, if your die goes off the table, hits another player's dice, or flies off the stack without rolling, it is considered a foul die. During the second and third round of play, if the dice rolled creates a double the player can call double to regain a die to use again. The first player to get 4 targets wins. You can also just play until all the targets have been claimed for a longer game. We had so much fun playing this game. It has got to be ranked as one of our all time favorite games we have played ever! We get loud, we get competitive, we strategize, we knock each other off the board, but more than anything we have an amazing amount of fun! Listen in as we play a little bit for you. Total warning: This game is extremely addicting. 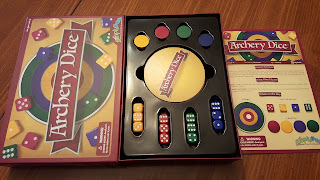 Not a day has passed since we opened Archery Dice that it hasn't been played. The first time, we played it for hours until we were all hungry and had to stop. After supper, we went back and played some more! You can find out more about SimplyFun on Facebook, Twitter, Instagram, YouTube, and their blog. To find out more thoughts on Archery Dice and The Climbing Knights be sure to click the banner below.